Have you ever tasted Uzbek plov (rice pilaf)? Let’s enjoy summer by having lunch together at our all-time favourite park. Bring your family along and get to meet some other international families. 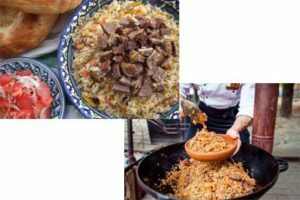 Watch how the food is made and chat over tasty plov, served fresh from the wok, for only €12.50 per (adult) person!! It’s a big serving, so you can share some with your young kids. Sign up now to reserve your space! Leave some comments below to express your interest. Advanced payment can be made via the link stated above. Please contact Hellen Chandra-Boortman via WhatsApp at +31 4938 4526 or email to secretarisdelftmama@gmail.com when you’ve done the payment, also if you have any questions. By joining this event, you are also raising some funds for our community. – The food is non-vegetarian. – The meeting point will be announced closer to the date. – Payment must be made in advance. – Children are welcome, but they won’t get their own serving. – Please bring your own food container and cutlery to reduce waste and to take home some leftover, if any. – Bring your picnic mat/pop-up tent for extra comfort.